Luxury Modern Riverside Apartment, very Central Location, 3 min walking to- Ghetto Square, 7 min to Old Synagogue i.e. Jews Quarter and also little further 6 mins down is the Old Town. 50 meters from Schindler Factory. Its a Brand New Apartment located very Central but extremely peaceful apartment overlooking Gardens. It's in one of the most Up-Market Residences Complex in Krakow. We are offering a Very SPECIAL PRICE OR DISCOUNTED PRICE just to get started and get feedback. Please look at the photos and email us ... and you will realize its very special price. 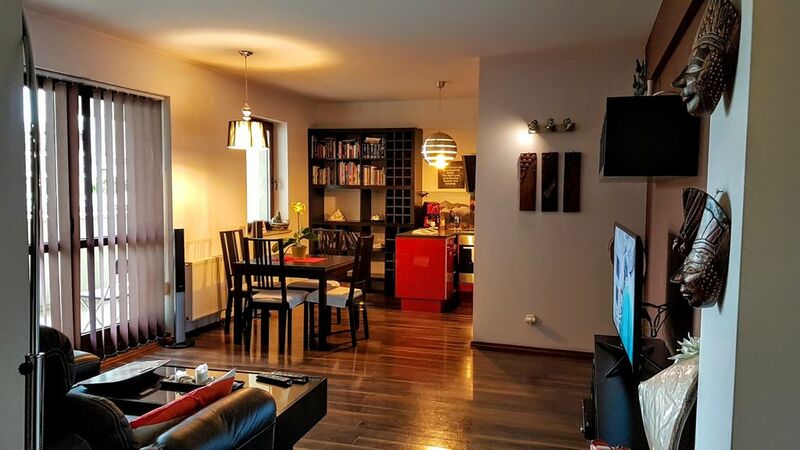 1 Bedroom & 1 Living room apartment in Krakow, one most upmarket apartment complex with grocery shop downstairs, Cafes, Restaurant. Also, less than 5 min walk to the tram stop. - You can contact us anytime of the day about anything that concern you, i'll be more than happy to help in anything I can. As mentioned, this is a very Up Market Residence Complex in Krakow, with 24 hr security, beautiful gardens and best this is its riverside. Just 6 mins walk to the Kaszimisz / Jewish District .... which is the hub of some of the best Cafes and Restaurants in Krakow. Its such an old world charm. I think walking is best but if you prefer just take a quick taxi to Market Square for only 5 euros. or use the tram stop 3 mins walk. SMOKING is allowed ONLY IN THE BALCONY. Hi I am Shubho. I am a Specialist Travel Organiser, so your primary benefit would be we will help you with great Travel Tips and help you organise your Holiday.... before you arrive here in Krakow. :-) Ania ( my better half) is works for Philip Morris International in a very good position but is fanatic about cleanliness ... so that is something should not worry attt allll :-) We both love Travelling extensively. Summer time - Europe and Winter to SE Asia. REVIEW: Clean, well appointed, comfortable, secure complex. The view of the courtyard from the large windows was beautiful. An amazing place to call home while visiting. Stores and attractions within walking distance. Many restaurants in the area. The owner was always prompt at answering any questions that we had. Made arrangements for pick up and drop off at the airport and for tours to Auschwitz/Birkenau and the salt mines all at reasonable and competitive prices. The staff we encountered were knowledgeable, courteous and friendly. A secure underground Garage/ Parking with 24 hour Security is possible , inside the apartment building but with a small fee. It is 8 Euro per day or 50 euro for a week. The modern apartment is stylish, clean, spacious and well equipped in a gated development. The balcony looks inwards to the large garden courtyard. Shubho arranged the keys by telling us in advance. It is close to the Schindler Factory museum.The tram stops to all parts of the city are about a 5 minute walk. Parking on the street is available and presently free. There is an underground car park below the development. We did not use the independent Sports Club but it looked good. A small supermarket open til 11pm is on the ground floor. The description is accurate and we enjoyed our 6 nights stay. A good choice. Thanks Shubho. It was a beautiful apartment in a upgraded building. Everything was clean and nice. We want to thank you again:-)!!!! Thank you Ania. for your kind words and writing a detailed review. For us, the most important thing is that you liked my apartment and really enjoyed your stay in Krakow :-) Hope to see you again.